Get your 3D Glasses and enjoy this image of Hello Kitty in full 3D! Chun Li Movie – Streetfighter Special? Do you guys watch Smallville? Well if you do then you probably know Kristen Kreuk who plays Clark Kent’s first love interest, Lana Lang. She’ll be dropping the girl-next-door look when she debuts as Chun-Li in the next Street Fighter movie. Yes, you read that right. There’s ANOTHER Street Fighter LIVE movie being made and Kristen Kreuk will be Chun-Li. Find out more after the jump. The movie is called Street Figher: Legend of Chun-Li and it’s directed by Andrzej Bartkowiak, the man behind DOOM which starred WWE superstar “The Rock”. The story of the movie will be centered on Chun-Li and not on everyone’s favorite, Ryu. Please, for the love of God, don’t make this into a movie like the one where Van Damme starred in. Here’s a video of Jean-Claude portraying Guile to refresh your memory. I think there are better candidates for Chun Li, look wise anyway, some cosplays here that I think really fit the Chun look! This is true to costume, the one below has “the look” but the costume isn’t blue. Why didn’t they pick a true asian face? Not something I would have thought of, for sure, from Shokotan. 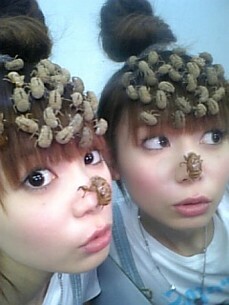 They are bugs and cicadas up there, they are actual Locust molts, so while they aren’t alive, they are the real thing! 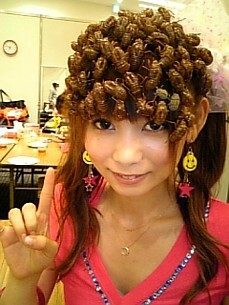 Shoko Nagawa, a Japanese pop idol and actress is apparently creating a new rage with the whole bug wear thing! The crowd went wild when after a performance she flung her dried Cicada’s into the crowd. If you’ve ever watched Neon Genesis Evangelion, you’ll find this one particularly weird and funny. I am not sure if I am able to eat out of a plate like this, but they’ve got the spear of longinus as an eating utensil, very interesting. For those of us who know Tokyo’s famous Akihabara district (Electronic town) and love it for what it is, and all the craziness, cosplay, anime and whatever else we think is cool, screwy, funny and dorky all at the same time, a tragedy emerged there just a day ago. Taken from Patrick Macias blog, the summary (worth checking out in more detail) is as follows taken from his blog. The growing tension and push-and-pull between the cops, the normal people, and the otaku in Akihabara was shaping up to be a grand saga, complete with flash mobs and organized protests. But now, all of that has been preempted by some loser who just wanted to kill people. Meta Tame calls it the AKB Massacre. This is tragic because real people died and got injured because some insane person decided to go there, crash his car into people and then take out a knife and stab people before being taken down by police. It was said he announced his intention to kill to the public via the Internet days before. Then, from the morass of it all comes an internet mob hunt against those that were less than respectful infront of news cameras… as posted in Japanprobe amongst other things and are now being hunted down by japanese internet mobs in more acts of hatefulness and other stupid things with posts and forum discussions debating the pro’s and con’s of effectively lynching innocent, yet arguably very stupid people. Were they stupid to do what they did? Yes, do they deserve to be lynched? I don’t remember reading in the constitution of any "democratic" country that you may be lynched for being stupid. As was commented, two wrongs does not make a right. For more news related information check out the Times. Just eight years ago, Komomo was a Japanese teenager living in Beijing, riding her bicycle around the city and playing pool with her friends on weekends. As Komomo recounted in A Geisha’s Journey, a book of essays and photographs by Naoyuki Ogino due out in May, she had no way of learning about the remote and secretive geisha world until she found a website run by Koito, a Kyoto geisha who also ran an okiya, or geisha house (www.e-koito.com) . “I was so excited that I e-mailed Koito-san right away, telling her my dream of becoming a maiko, an apprentice geisha, but that I didn’t know how to begin,” she says. Komomo moved into Koito’s okiya in Miyagawa-cho, a cluster of narrow, stone-paved streets lined with wooden houses in central Kyoto. Her first weeks were spent learning to greet people with polite bows, wear the kimono and speak in the soft Kyoto dialect. “In the first year, it seemed I was scolded all the time. That was my job, to be scolded,” says Komomo, who stands barely 1.5 metres tall. Each demanding day begins with lessons in dance, singing, tea ceremony and music, and continues with parties - the geisha’s real work - from six until midnight. With only one day off every two or three months, Komomo at first sometimes longed for the life of an ordinary teenager, able to see movies on a whim. But she only thought of quitting briefly, during her first two weeks, when another girl decided to leave. Wearing an elaborate maiko kimono with long sleeves and a wide, trailing sash, and learning to walk in the outfit without bumping into anything or anyone, especially during dance performances, was hard. Komomo also forgot rules and lost hair ornaments. Komomo’s life overseas - she was born in Mexico and spent some years in Japan before moving to China - has helped her break the ice with guests. But there were problems. “At first I had some friction with ordinary life in Japan, and I was a bit cheeky. Here they say it’s best to act as if you know nothing, but actually be really clever. “Every so often, I got conceited from all the attention, but somebody soon brought me down to earth,” Komomo says of her five years as a maiko. She won’t say what she earns, but bystanders at the theatre where she took part in a dance performance say she is popular. She owns a house, and its main room has a huge flat-screen TV and new model Macintosh computer. “I was told when I began that I’m not an incredible beauty so I should try to always keep a smile on my face. Beauties get work easily, but I need to work at it,” she says. She confessed to worries about the future. There are no pensions for geisha and they are not permitted to marry, though in the past some were supported as mistresses. Some even became single mothers. The economic woes of the 1990s slashed the expense accounts of business executives who were once the mainstays of geisha, while politicians shunned lavish spending after scandals. A dinner with a geisha present can cost around 80,000 yen (HK$6,000) a person, depending on the venue and the number of geisha. Another problem is that men today tend to prefer less formal entertainment such as karaoke or hostess bars. “In the old days, people only got to know geisha through introductions, but now people rely on the internet to gather information,” says Kyoko Aihara, a geisha expert and author. This is a remix AMV which features a great cut and paste job of anime clips and some funny comedic music, cute and fun. It was so cute, had to share it, Christmas should be happening next week again! Below was a press conference on Ponyo and a few questions were asked on the new production. There is also a music CD available as well on sale already. Here, Miyazaki hard at work in sketching and drawing out Ponyo and script. So not exactly Final Fantasy, but almost, it’s a funny cosplay I wanted to share with you via Flickr.